Can art express an opinion on current political issues, religious tolerance or the power of capitalism? Redefine the Enemy examines the political potential of art in a changing society. While artists were, until recently, still assuming the position of independent observer, they now realize that they, as well as the public, are part of a larger political-economic system that steers and influences us. Is there still a role for social criticism in contemporary art? The artists in the exhibition put the opinions of the public to the test with works in which established social standards and values are undermined, denied and reversed. The presentation Kingdom Come, compiled by Sea Urchin Editions (Ben Schot), revolves around the utopia as an alternative for the ever-expanding consumer society. Since 2000, the independent publisher Sea Urchin has focused on works from the historical avant-garde and counterculture, movements that, besides being committed to destroying the existing power structures, were also a mixture of all kinds of utopian tendencies. 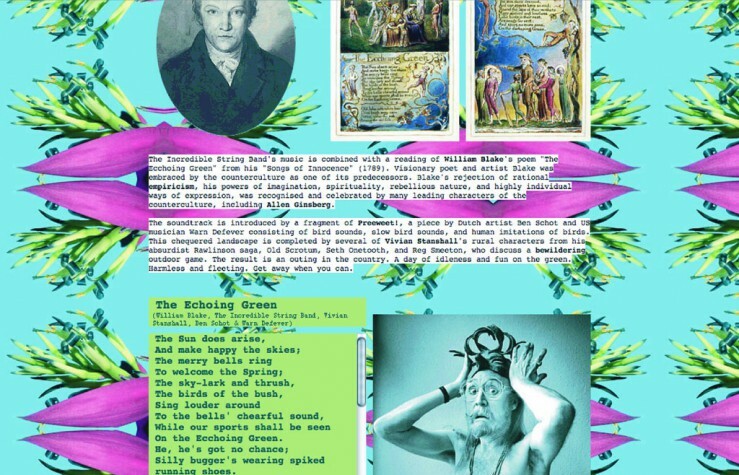 Sea Urchin seeks to reposition the counterculture through the publication of printed matter (incl. André Breton & Philippe Soupault) and by distributing pamphlets from the collective The Buggers. For Kingdom Come, Sea Urchin invited a number of independent publishers, thinkers, and artists to react to the concept of utopia. Gerard Bellaart (Cold Turkey Press) presents a dystopian selection from his archive. Former Provo and Kabouter leader Roel van Duijn makes a selection from his private archive (housed in the Internationaal Instituut voor Sociale Geschiedenis Amsterdam). Cary Loren (The Bookbeat/The End Is Here) presents the Soviet science fiction film Aelita (1924) by Yakov Protazanov. René van der Voort (Any Record) compiles a presentation on communes. The Buggers produce a flag and a pamphlet. Two Scandinavian students of the Piet Zwart Institute Terje Øverås and Jacqueline Forzelius make new works. And the Somniloquy Institute presents a utopian slideshow. The total-installation Forty Years of Boredom 1968-2008 by Vincent W.J. van Gerven Oei and Jonas Staal can be interpreted as a three-dimensional manifesto. In recent years Staal has become well known in the Netherlands as an activist artist who provides uncompromising social criticism in his work. Using mediagenic public actions, he exposes political rhetoric (the Geert Wilders Works, 2005-2007) and pushes the limits of the constitutional state. Van Gerven Oei graduated last year from the postgraduate Koninklijke Academie Den Haag and takes his Ph.D. at the European Graduate School (Switzerland) with a thesis on rage and irrationality within the philosophical discourse. The heart of Forty Years of Boredom 1968-2008 is the film pamphlet Follow Us or Die (2008). 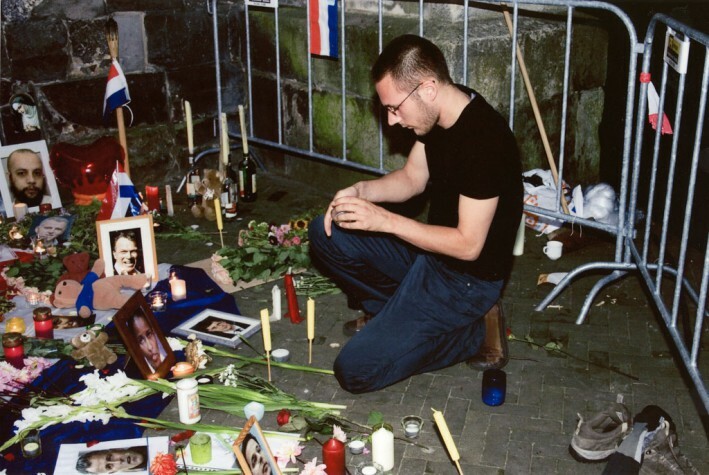 Staal and Van Gerven Oei collected images from the Internet and film archives in which, among other things, the perpetrators of well-known incidents of violence (such as the ’high school shootings’ in Columbine and Virginia Tech) are speaking. From the disjointed film, an image emerges of aggressive and existential protest. In the audio piece Citations #1 and #2 (2008), the artists recite transcriptions of statements made by the ’high school killers’ Auvinen and Harris. As a pendant to Follow Us or Die, the film pamphlet Réfutation de tous les jugements (1975, 22 minutes) by the French filmmaker and theorist Guy Debord will be screened. In the film Debord parries the criticism of his controversial film La société du spectacle (1973) with an argument on the myth of the involved viewer. Finally, Against Irony (2008): a burning protest against the use of irony in art and theory, chiselled into four bluestone slabs. 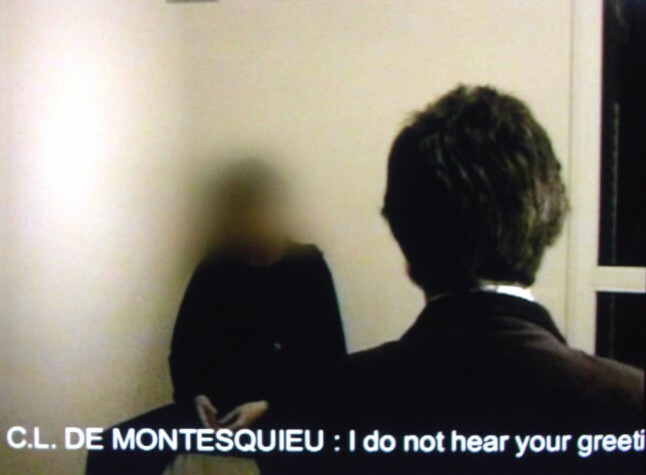 From Daniele Pario Perra, the work Twenty Questions to Baron Montesquieu (2006) is presented. In this video the eightteenth century statesman is contacted through a medium. A scientific committee poses a number of pressing questions to which Montesquieu replies. In 1748 Montesquieu published ’De l’esprit des lois’, in which he introduced the trias politica (separation of the legislative, implementing, and judicial powers). The current Western democracies are based on this principle. The Italian artist Daniele Pario Perra finds it essential for us to turn to political leaders of the past in the absence of modern-day visionary leadership. Pario Perra often links his art projects to politics, sociology and urban development. He collects subversive graffiti texts and has developed a technique for preserving them. In 2004 he published an advertisement in an Italian national newspaper in which he offered his vote to any culture-loving politician who was willing to contact him. Nobody called. The filmmaker/artist Mostafa Heravi won the public award at the TENTAcademy Awards in 2oo7 with his film Dageraad. The film tells the story of a man, who one morning just decides to walk into a café. After this decision, his life is changed forever. A few years ago Heravi fled from Iran and studied film at the Gerrit Rietveld Academie in Amsterdam. His latest film The Supper is based on the famous fresco The Last Supper by Leonardo Da Vinci. In The Supper the twelve male apostles have become twelve women. They sit dressed in chador at a table around a male Jesus figure. In slow images, Heravi presents us two versions of an unspoken story in which the mutual relationships are highly charged. Heravi chose as soundtrack an emotional composition by György Ligeti, which gives a great intensity to every gesture of the actors. Anne Schiffer examines the relationship between social hierarchy and the use of accompanying status symbols. She is particularly interested in the difference between winners and losers, between accepted and unacceptable behaviour. In her performances and installations she copies the highly desirable status objects and imitates the behaviour of her role models. She strives to emulate every role that she assumes without reservations. In her recent work she raises the matter of the failure of great ideologies by showing that which truly governs us: the power of money. Justin Wijers makes drawings of the victims of violent crime and road traffic accidents that he finds on the Internet. Beauty and brutality compete for precedence in the images, with titles such as And they’ll show us proud parents, and Blumchen. He portrays the anonymous victims, which can be found in abundance on morbid Internet sites, with great devotion and attention. 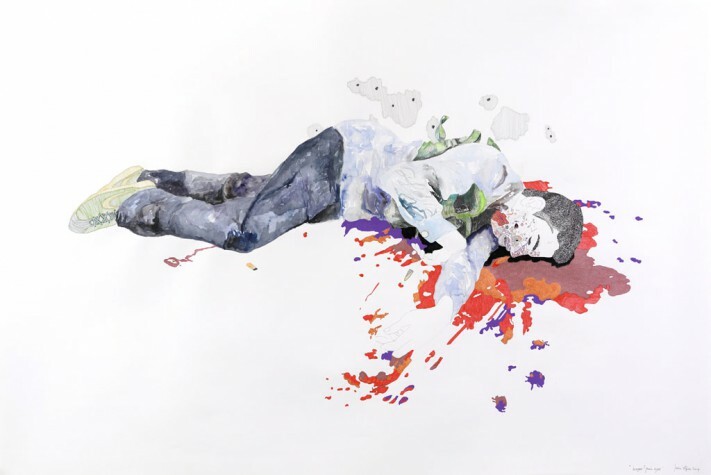 With thin colour felt-tip pens, he renders the battered bodies in tenuous, precise lines. The colourful patterns of the felt-tip pen make the unrecognisably mutilated bodies reminiscent of a contour map or a field with flowering plants.